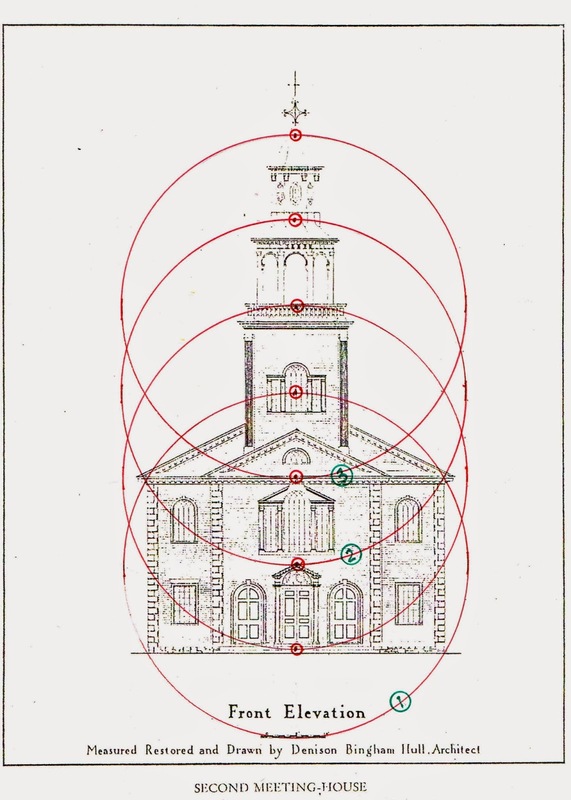 This is part of a series on the geometry of the Old First Church (OFC). Bennington, Vermont. 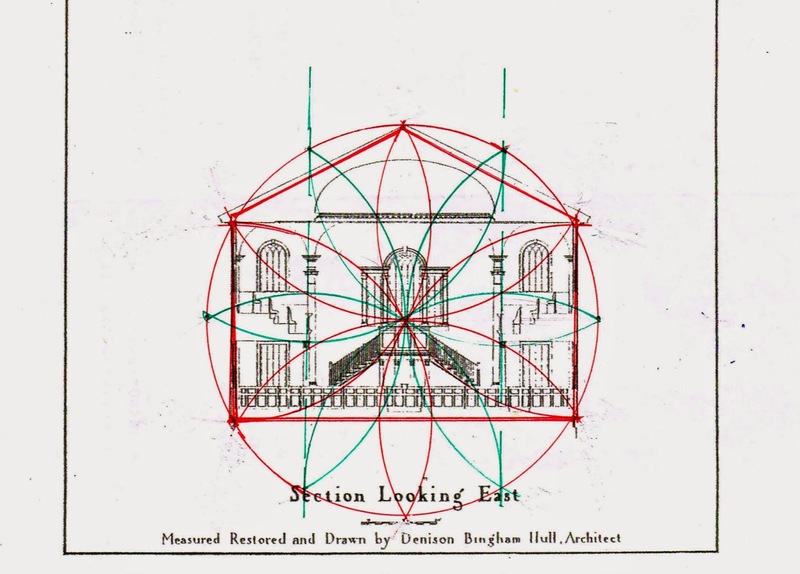 I began looking at the geometry of the church in 2012 beginning with the 'rolling circle' muntin pattern in the rounded tops of the windows. I found that the repetition of the circle I saw in the windows was used in the window and column placement of the side elevations. 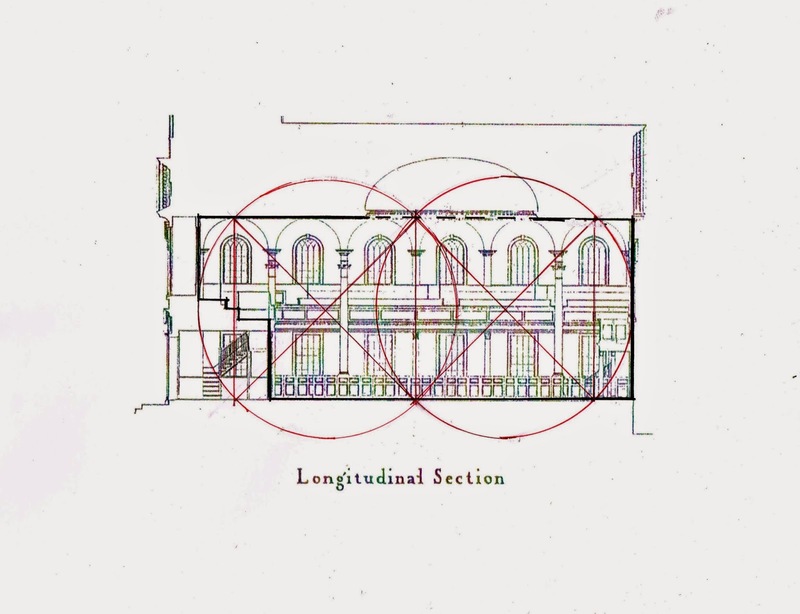 The length of the sanctuary is also governed by the repeating circles. 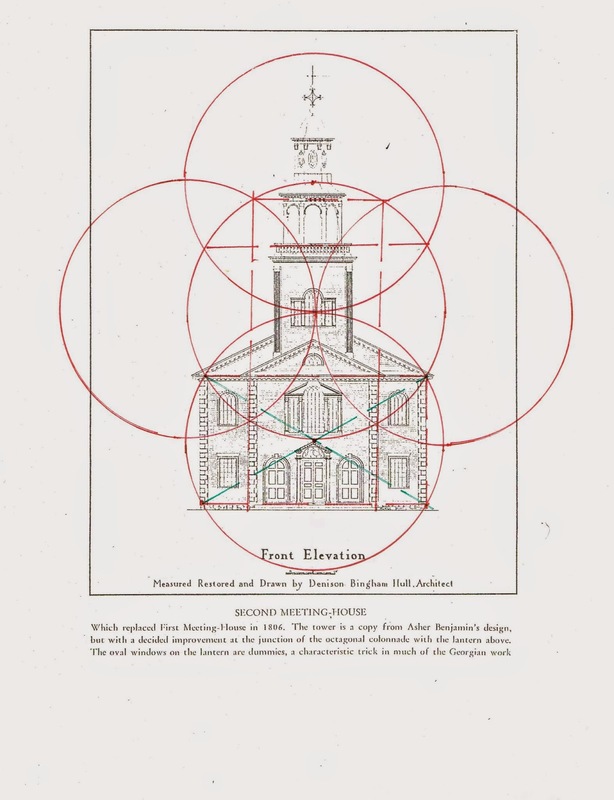 The circle divided into its 6 parts - the daisy wheel - defines the church's width and height and its roof. These drawings I have already discussed in the earlier posts. 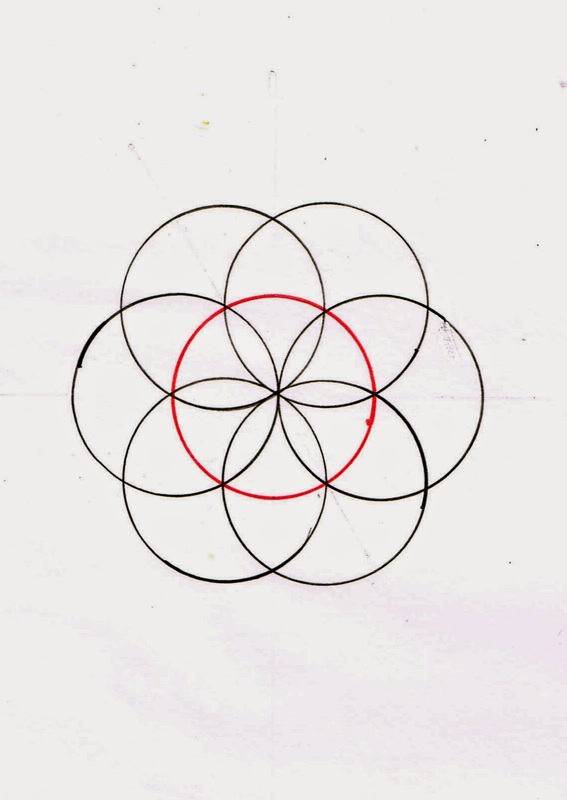 The daisy wheel rotated 30*, or with a horizontal axis instead of a vertical one, the line between the 'petals' defines the column placement - the outer side of the columns. The diagram below shows how the same proportions - the main nave of the church and it's side aisles can be laid out by locating the circles 90* instead of 60* to each other ( 4 petals on the daisy instead of 6). The front elevation of the church is governed by the same circle. Then the first circle's center is the bottom point of the diameter the second circle. The second circle's center is the bottom point of the third circle's diameter. 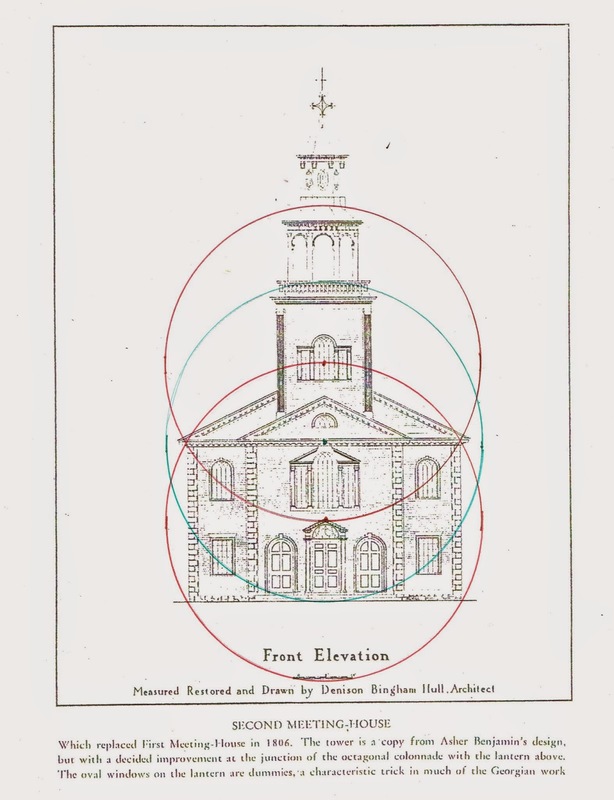 The 3 circles together encompass the church and its tower. 7) the height of the architrave above the columns and their arches that surround the bell. I have drawn the diagonals of the bottom circle in green which mark the rectangle of the church body. Note how it determines the roof of the main door. I have added dashed red lines at the sides of the extended narthex ('porch') and extended those lines up to meet with the line marking the top of the belfry. 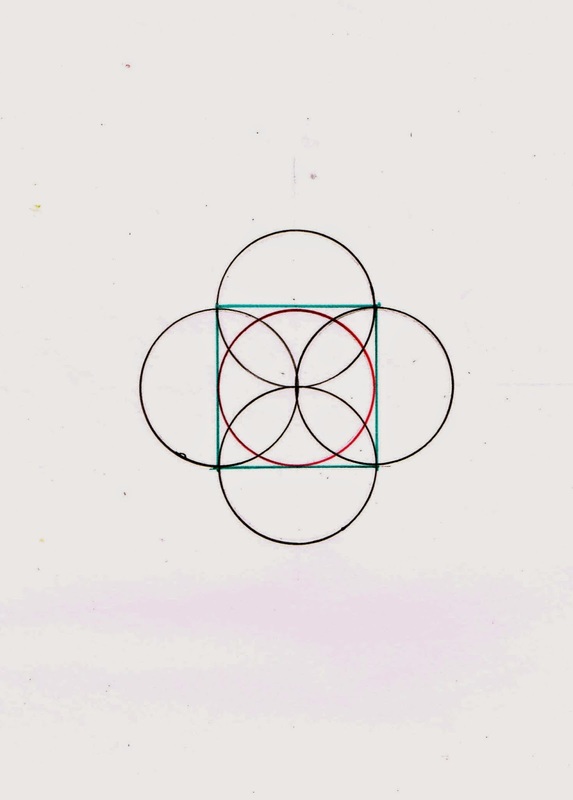 Here is the diagram of circles extending both horizontally and vertically, creating squares instead of daisy wheels. It's just a reminder. I've laid out its construction in earlier posts. Lastly, here are the circles in the same rhythm as those which determine the pattern in the windows. 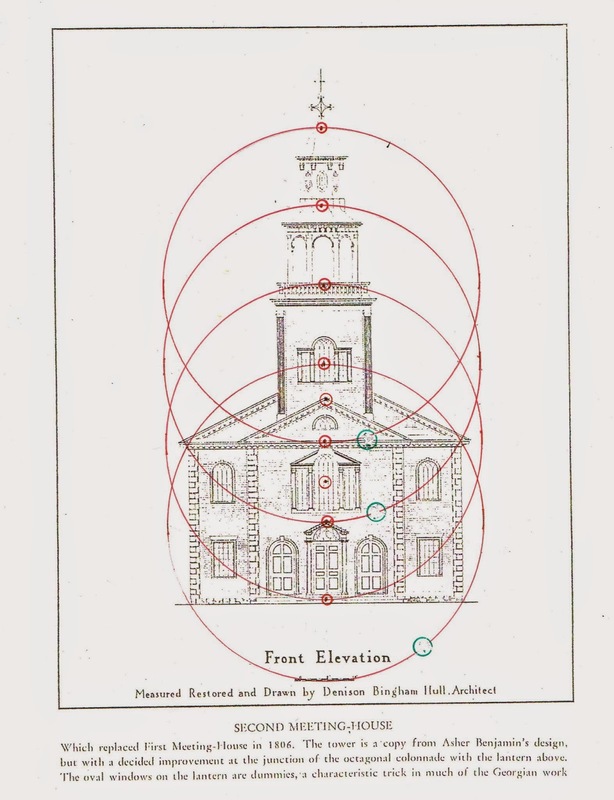 (1) The first red circle at the bottom encompasses the church. Its center is at the top of the pediment over the main door. (2) The second red circle sits on the center of the first. Its center is the Palladian window in the tower. 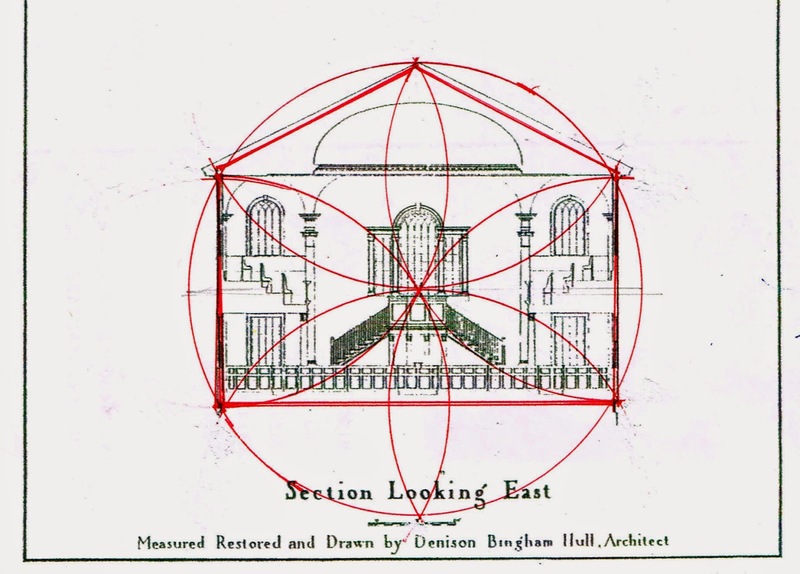 (3) The green circle's center is on the line laid out by where the first 2 circles cross which is also the peak of the oerdiment over the 2nd floor Palladian window. It extends from the floor of the church to the rail of the belfry. The circles can 'roll', just as does the muntin pattern of the windows. Here are some of the circles that grow of the 3 laid out above. Each circle's location is determined by those on either side. The centers are noted with small red circles. Note that they determine important features of the facade. The circles themselves were numbered in green - visually it was too confusing. There are many points I have not called out. It is just clutter at this small scale. Remember that pictures can be enlarged by clicking.